Seth Frantzman is a PhD student in Geography at the Hebrew University, a contributor to the Jerusalem Post, Frontpage magazine and Middle East Quarterly and runs the Terra Incognita blog. ([email protected] ). This is not a description of either of Israel’s wars in Lebanon or the recent war in Gaza. It isn’t a description of the Second Intifada. It is a description of the Jordanian Civil War by Avi Shlaim, a Baghdad born Israeli who has been a professor of international relations at the University of Oxford for many years. However in describing the recent war in Gaza Shlaim took a more critical tone. He noted that it was predicated upon a “fundamental rejection of the Palestinian national identity [by Israel].” He accused Israel of having “never in its entire history done anything to promote democracy on the Arab side” and instead “continued to play the old game of divide and rule between rival Palestinian factions.” It was a war “between Israel and the Palestinian people.” He declared that “As always, mighty Israel claims to be the victim of Palestinian aggression but the sheer asymmetry of power between the two sides leaves little room for doubt as to who is the real victim… a small and defenseless Palestinian David faces a heavily armed, merciless and overbearing Israeli Goliath.” Hamas resorts to the “weapon of the weak-terror…. Under the circumstances, Israel had the right to act in self-defense but its response to the pinpricks of rocket attacks was totally disproportionate.” Shlaim noted that “killing civilians is wrong… but Israel’s entire record is one of unbridled and unremitting brutality towards the inhabitants of Gaza.” Israel’s propaganda is a “pack of lies.” Furthermore “Israel’s objective is not just the defense of its population but the eventual overthrow of the Hamas government in Gaza by turning the people against their rulers… Israel’s insane offensive against Gaza seems to follow the logic of an eye for an eyelash… There is simply no military solution to the conflict between the two communities… The only way for Israel to achieve security is not through shooting but through talks.” Shlaim concludes that Israel is a “rogue state” with “an utterly unscrupulous set of leaders.” (the latter a quote he attributes to Ernest Bevin). When describing the Jordanian Civil War Shlaim is massively sympathetic to the Bedouin populace. He noted that “their patience was strained beyond endurance by the lawlessness of the [Palestinian] fedayeen.” (p. 319). Shlaim praises the work of Abnan Abu-Odeh who had been placed in charge of “psychological warfare” and had a “greatly respected..sharpness of his analysis…to explain the government’s policy…awareness of the importance of public relations.” However with Israel the “brutality of Israel’s soldiers is fully matched by the mendacity of its spokesmen.” Shlaim admits that the “Palestinians constituted well over half the population of Jordan (p. 342)” but does not seem to think this merits applying the word ‘apartheid’ to Jordan. Shlaim applauds the Jordanian army for being “desperate to confront the [Palestinian] fedayeen and put them in their place…it could no longer tolerate the abuse and humiliation.”(p. 320) Shlaim cavalierly argues that “Jordan had erupted into civil war not because of the relationship between the regime and its Palestinian population but because of the challenge to the regime mounted by the fedayeen as an armed movement” (p. 343) who were “hopelessly outnumbered.” (p. 343). In addition the Palestinians were a “collection of separate and divided guerilla groups.” Yet Shlaim does not condemn Jordan for disproportionate force. Nor does he once use the word ‘civilian’ in relation to the Palestinian deaths in the civil war, yet he mentions the huge figure of 3,400, a figure that is mostly civilians. By remaining silent Shlaim seems to condone their deaths or pretend they were not civilians. In killing 3,400 Palestinians however Jordan is said to be fighting just the “fedayeen” or “self sacrificers.” Israel is accused by Shlaim of exploiting the differences between Palestinian groups, Hussein is praised for cultivating Palestinians to collaborate with him. The difference in Shlaim’s description of the Jordanian Civil War encapsulates all that is wrong with his hagiographic, Lion of Jordan: the life of King Hussein. The book, which is a masterwork of lucid, enjoyable writing, is also a hagiography passed off as scholarship that might have been published by the Jordanian government. This is not to condemn King Hussein, for history has shown that he was every bit the remarkable and brave man that Shlaim portrays him as. But the one-sided absence of critique that is so blatant in Lion of Jordan is not only a disservice to history, it is also a hypocrisy considering the withering criticism Shlaim has subjected all of Israel’s leaders to in his Iron Wall and other writings. Why the double standard? Why praise for Jordan’s annexation of the West Bank but condemnation for Israel’s annexation of the Golan? Why praise for one country seeking security and a leader who acts “decisively” to accomplish this and condemnation for another country? Why praise and understanding for one army that feels humiliated in the face of terror and condemnation for another when it dares to react? The answer says much about his one sided, discriminatory view of Israel that is all too common among academics in the U.K and elsewhere. 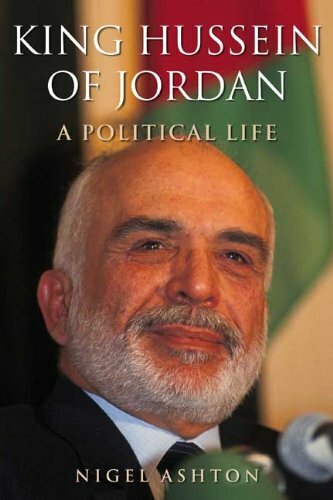 In describing how Jordan, “a small, impoverished and insignificant country” came to “occupy such a prominent part in regional and international politics” (p. 281), Shlaim says it “largely lies in the personality and policies of King Hussein…a strong, energetic and charismatic leader.” (p. 281). No such praise for Ben-Gurion and his transforming of small, impoverished Israel. While Shlaim consistently condemns Israel for its supposed “iron wall” approach to the Arabs he describes a warm meeting between Golda Meir and King Hussein in 1965 in which they talked about their “dreams for our children and grandchildren to live in an era of peace…she suggested that maybe a day would come when we could put aside all the arms on both sides.” (p. 223). Yet Hussein is praised for his courage while Meir is condemned elsewhere by Shlaim. There will be no ‘Lioness of Israel’ hagiography of her. Avi Shlaim is a racist: he either believes that Jews must be held to a higher standard than the rest of humanity or he believes that Arabs are incapable of respecting human rights like others and thus must be held to lower standards than the rest of humanity. This is apparent from his latest book Lion of Jordan. Like Avi Shlaim, Nigel Ashton is not a newcomer to Middle East politics. He is a senior lecturer in the Department of International History at the London School of Economics and he has written on the political dimensions of the U.S and U.K dealings with Nasser’s brand of Arab nationalism. To write King Hussein of Jordan and provide an original biography Ashton was able to get special permission for “unfettered” access to the King Hussein’s correspondence files [page ix]. One of the central problems with this biography is its reliance on a fast narrative that does not provide enough analysis or explanation of events. Two important Israeli raids, the first on Jordan at Qibya in 1953 and the other on Gaza in 1955 are mentioned as precursors to events but there is little explanation given as to why they happened or their ramifications. Another raid in 1956 on Qalqilya is presaged by “escalating border incidents” which leaves the reader oblivious to what actually happened. Like Shlaim he simply whitewashes the reason for Israel’s reactions. Given the pace of the narrative, which is required to detail the rich and fast paced world of Hussein and the Middle East maelstrom he lived in, there are events and arguments that seem to beg further attention and analysis. For instance the discussion about the Israeli raid on Samu in 1966 and its implications for “those historians who believe that from 1963 onwards a strategic partnership had emerged between Israel and the Hashemite regime [page 107].” Which historians? The footnote includes only one author and book as reference. One of the high points of the book is the description of Hussein’s role in the Gulf crises and war between 1990 and 1991. Of specific interest is the correspondence between Hussein and President George Bush Sr. The story of Hussein’s embracing of a more nationalist Arab-Muslim view is interesting when contrasted with his meeting Israeli Prime Minister Yitzhak Shamir before the conflict broke out. In a speech on February 6th, 1991 he spoke of his “Palestinian brothers” and the “crime against” the Muslim religion and the Arab nation [page 279]. Like Shlaim, Ashton eschews criticism of Hussein. He notes without pausing that “the king instructed the cabinet that the press should not attack the Eisenhower doctrine[page 62].” Any other leader in the region, whether Ben-Gurion, the Shah or Mubarak, would come in for heavy critique for similar actions while Hussein is seemingly above reproach. Ashton and Shlaim’s biographies are equally important. Whereas Ashton’s may reveal more information about the King in the 1990s, Shlaims is the better written of the two. However Shlaim’s is also the more hagiographic. Both suffer from an unwillingness to criticize, even in the most minor way, the King. This makes both of these biographies unacceptable in a world that has long ago abandoned the idea that the king must always be praised and be beyond reproach. While the United States revolutionaries understood this in 1775 it seems that many western scholars of the Middle East have still not learned this today. It is an inexcusable situation that reflects badly on King Hussein, for a critical biography would still reveal his greatness and peacemaking skills.